China's vast censorship apparatus is using a new technique for rooting out banned words, experts say. Censors are now scanning images shared in the hugely popular messaging platform WeChat and pulling them if they contain certain sensitive words or phrases, according to a new report from the SANS Internet Storm Center, an international monitoring organization. Some Chinese social media users had started using images featuring sensitive words because they could slip past the censors' software that scours the text of posts. Images are much harder to filter because they typically require humans to look at each one. Now Chinese authorities have found a way to use computers to do some of the work, according to the internet center's report. The new approach, which uses what's known as optical character recognition technology, is "highly sophisticated" and demands a lot of computing resources, said Johannes Ullrich, the center's director. Ullrich said he and his colleagues started seeing the new technique in action just this week. It first came to their attention when censors banned a photo of a breakfast recipe, much to the amusement of Chinese internet users. The image was banned because the recipe contained the word "end" (instructing cooks to "cut the end of mini sausages into an X-like shape"). In Chinese, "end" sounds like "emperor" or "throne." Those words became sensitive this week because they have been used to criticize President Xi Jinping. China on Sunday proposed amending its constitution to allow Xi to stay in power indefinitely, prompting dissidents and critics to call him "Emperor Xi." Other images featuring sensitive words related to Xi were also being pulled out of WeChat, which is owned by Chinese tech company Tencent (TCEHY). The SANS Internet Storm Center tested the new Chinese filter earlier this week with a list of 25 sensitive words and phrases, such as "long live my emperor," "immortality," "unlimited," and so on. The problematic images were censored while in the digital pipeline between WeChat senders and recipients. They simply didn't arrive. "It's about speed," Ullrich said. "They don't want to appear to remove images after the fact. They have a second or so to do it." The technique suggests tight collaboration between Chinese government censors and Tencent. Tencent and China's Cyberspace Administration did not respond to requests for comment. In order to operate their highly profitable internet businesses, Chinese tech companies have to play by the government's rules. US social media platforms like Facebook (FB) and Twitter (TWTR) are blocked in the country. The new image censorship on WeChat also appears to be very targeted. SANS Internet Storm Center tested it in a WeChat group with a few dozen people. Users in the US received and saw images containing banned words, while those in China did not. It's unclear how widely Chinese authorities have deployed the technology, though. 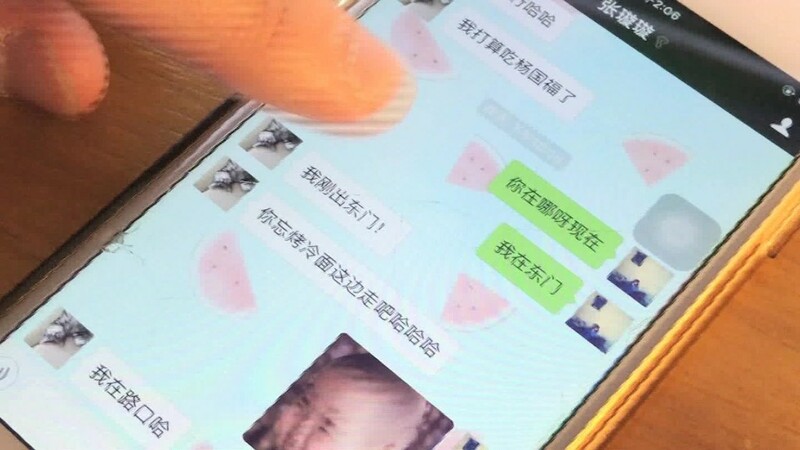 CNN employees in Beijing and Hong Kong were able to share images with the sensitive words with each other on WeChat. Still, using the software to partially scan some of the huge number of images sent over WeChat highlights the trend of China's increasing automation of censorship. "They are more throwing technology at the problem instead of people power, which they had done in the past," Ullrich said. That shift fits with China's vow to become a global leader in artificial intelligence. AI has been hailed as a life changing leap forward for humanity by some, and a harbinger of doom by others. In China, the rise of the technology will likely serve multiple purposes, says Ullrich. "With AI it's about keeping people happy by keeping them rich, and also keeping them happy by keeping bad information out of the country," said Ullrich. -- Qiaoqiao Yu, Nanlin Fang and Steven Jiang contributed to this report.